Since its inception in 1973, the PELLENC Group has based its development on a policy of constant innovation in order to anticipate changes in its markets and offer customers increasingly efficient solutions and products. 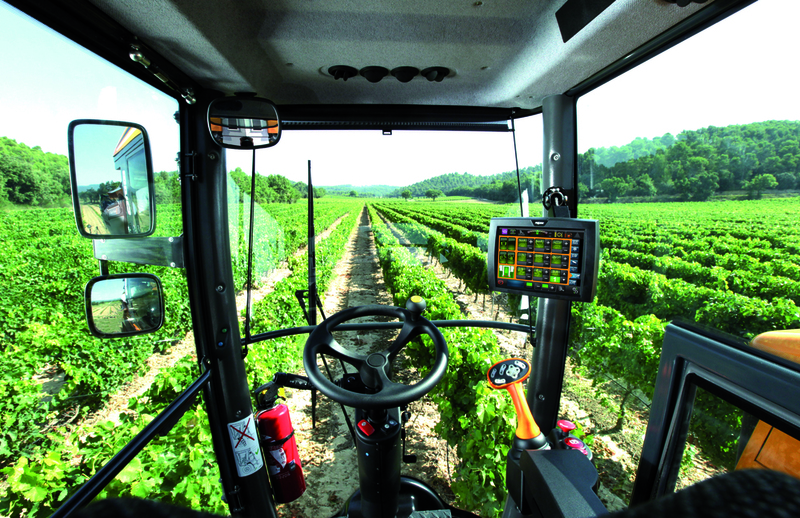 The Pellenc harvesting system, characterized by the oval shape of its picking rods which are actuated at both ends, has a condensing zone at the vegetation entry point, an adjustable length active zone making the machine adaptable to all vineyards, grape varieties and types of trellising, and a widening exit zone at the rear which ensures that the vegetation is released gently. This is the only harvesting principle that ensures a constant distance between the left and right picking rods, guaranteeing damage-free shaking. Several models are available: Smart (hydraulic shaking) and Selectiv’ on-board Process (hulling and sorting table). The Pellenc grape harvester is equipped with two catcher plate ramps that form the watertight base of the head. The angle of each ramp can be adjusted, and each includes several pairs of catcher trays mounted on elastic hinges. They are closely overlapped to ensure that they slide along smoothly and do not damage the vine trunks. The catcher plates are very resistant to impact and wear. Reception and conveying of the crop is by means of endless belts fitted with top cleats located on each side of the machine. The open structure Pellenc Patent makes it possible to eject foreign bodies and avoid blockages. An alarm is activated to give a warning if a blockage occurs. All parts of the machine that come into contact with the harvest are made of stainless steel or food-grade material. The conveyors can also operate in reverse and direction, and their speed can be synchronized with the forward speed and the size of the crop. 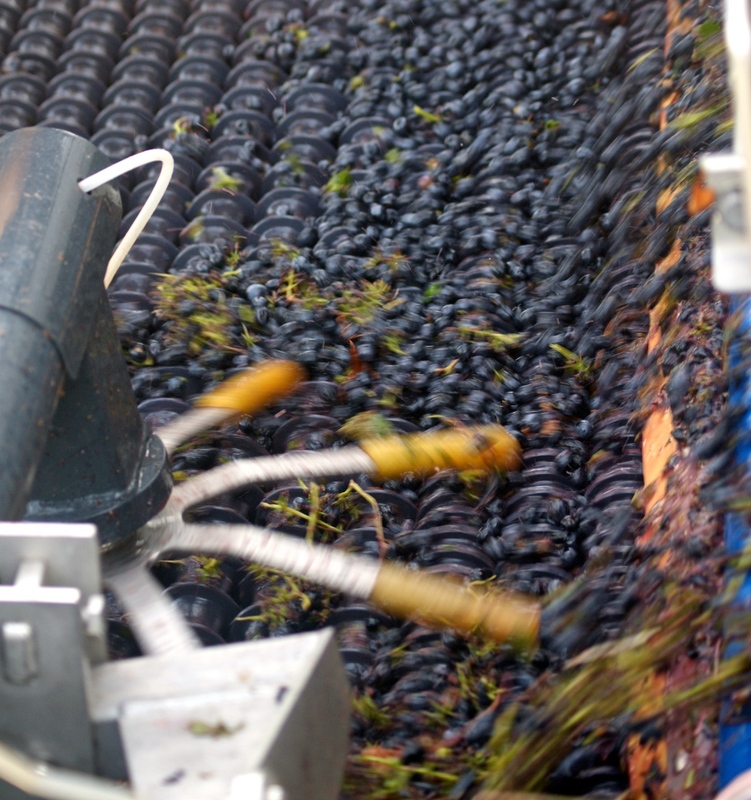 As soon as the grapes arrive on the conveyor belts, they are cleaned in a fall zone to avoid suction of juice, by two fans equipped with cane grinders with interchangeable blades. The rotational speed of the Fans that are driven by hydraulic motors can be adjusted from the driver’s station. Once the grapes have been cleaned, they are collected in bins, the capacity of which varies according to the model. The bins are equipped with Augers to distribute the load evenly. The hydraulic components are protected by a set of covers and casings in order to protect the harvest from contamination in case of a leak. The open structure design also makes cleaning and maintenance operations much easier. The Sorter comprises a grid-type continuous conveyor. It separates the juice, the grapes and whole bunches. It is located directly at the exit of the elevator conveyors. Two suction fans are located on the rear conveyor chute that completely remove all the leaves while retaining all the juice. The working speed is identical to that of a standard harvesting head (Pellenc or competitors’) without loss of juice. The linear grape separator and the sorting table are easily dissociable. The Selectiv’ Process on Board only weighs 300 kg more than the current harvesting head. The result obtained can be checked and viewed directly from the driver’s station while harvesting. It is a simple mechanical system and the noise generated by this new harvesting head is significantly less than on other types of equivalent machines. Harvesting can be carried out by day or at night and there is a bin filling level display inside the cab (optional). The harvesting head can be cleaned in less than one hour. The notched solid rollers turn the grape stalks towards the outside. The sieve rollers free the grapes which then fall into the bins, and discharge the waste which then falls into the row. The IFV carried out tests on the Selectiv’ Process on Board during harvesting in September 2007*. These tests prove that the harvest obtained only contains 0.18% of waste. i.e. 669 g for a 382 kg harvest!. * Tests by the IFV French vine and wine institute (Institute Français de la Vigne et du Vin), carried out on September 14, 2007, at the V’Innopôle at Lisle sur Tarn. Tests carried out on an 8 tonnes-per-hectare Syrah trellised vine. -The efficient, economical Pellenc solution carrying out all types of work in the vineyard. -Work several rows in a single pass. -Coupling and uncoupling simplified with EASY CONNECT hydraulic mono-coupling. -Change tools in just 3 minutes. -With EASY POWER depending on the requirements of the carrier and the tools being worked with. -Spacious and safe ROPS 4 (Roll Over Protection Structure) cab. -Unmatched turning angle with EASY TURN (95°). -Simple adjustment of harvesting settings with EASY SMART. -Reduction of fuel consumption of up to 43% per hectare. -The carrier is the most compact on the market. -Perkins TIER IV motor that meets the latest environmental standards. -Time and maintenance costs reduced. -Foliage protected with eh ACTIV' harvesting head. -EASY SMART gentle and effective shaking. -Harvest sorting as soon as the grapes are picked with the Flexible Sorter Conveyor. Secure cab Complies with anti-crush standards (ROPS 4: Roll Over Protection Structure). - Equipped with break glass hammer, fire extinguisher, dual position rear-view mirror, two point seat belt and presence sensors. Split, electric wide-angle side-view mirror, adjustable in width. 5 emergency stops 1 on the armrest: tool/harvesting head shutdown. - 1 on the steering column: full machine shutdown (including motor). - 3 emergency stops on the harvesting head: above each lower suction fan and on the cleaning remote control. - 1 battery switch that is easily accessible. Automatic parking brake The parking brake activates itself and turns off automatically when the machine stops and restarts. Visibility both day and night 12 standard lights with two directional lights + 2 optional led lights. - 2 color, night vision cameras with a screen inserted into the EASY TOUCH. The joystick is on a fixed pivot: the driver does not move his arm, piloting is done by pulse or continuous pressing. - Instant reset and change of direction in a single movement. Ergonomic and practical with backlit keys. EASY TOUCH tactile control panel Adjust all settings of the Pellenc Multifunction tools from the cab. Intuitive control and settings pictograms without text: only one screen for managing all machine functions. - With EASY SMART, adjust all the harvesting settings directly. EASY TOUCH also incorporates the guide lights for the rows, speed regulator, and acreage counter. Driver assistance Safety inclinometer for automatic tilt correction. - Automatic centering of the ACTIV' head in the row with stop indicator in the cab. - Ground detection with automatic lifting. - Programmable height stops: position: work, headland, and road position. Vibrating deflector and vegetation spreaders: quality sorting in difficult conditions, even at high speeds. We are stocked with certified Pellenc parts for all the above machines. If you need any repairs on your Pellenc equipment, or just need a routine service, call or simply bring in your equipment to schedule service. PURCHASE YOUR NEXT PELLENC VINEYARD EQUIPMENT FROM US! As a certified dealer for Pellenc we are equipped with the knowledge and information you need when considering purchasing a new piece of equipment! Give us a call to discuss how we can help with your purchase.